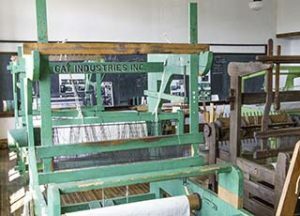 The second floor of the school contains a room full of looms, including this historic one from Gay Industries. The town of Gay, Michigan, is located on the shore of Lake Superior along the southern edge of the Keweenaw Peninsula, about 12 miles south of Mohawk. It was originally a commercial fishing village to harvest fish from Lake Superior and later a lumber community to harvest wood for the copper mines of the Keweenaw. In 1898 the Mohawk Mining company built their stamp mill in Gay to take advantage of the water available from Lake Superior to use in stamping or separating copper from mine rock. Soon another mill for the Wolverine Mining Company was built alongside the Mohawk mill and the town of Gay became part of the copper mining process in the Keweenaw. The town was named for Joseph E. Gay, one of the founders of the Mohawk and Wolverine Mining Companies. The stamp mills closed by 1932 and today only a large smoke stack and a mile of gray stamp sand are left of the mills. The first school in Gay was built in 1902 to meet the needs of the families working at the mills. It became overcrowded and a new, six room, two story building was built in 1927. It served students from grades one through 10. Students attending school past grade 10 went to Calumet. The school was a center of community life until the mills closed in 1932. By 1959 only 25 students attended the school and it was closed in 1961. 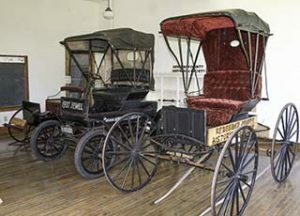 The first floor of the school contains a restored classroom as well as these example of early Keweenaw transportation: A horse drawn buggy, a sleigh, and a 1908 Jewell, one of the first horseless carriages in the Keweenaw. In 2009 the Keweenaw County Historical Society took over the property and began extensive repair and restoration work. The school has become a museum telling the story of the town of Gay and the impact of the Mohawk and Wolverine Copper Mining Companies mills on the town of Gay and the environment. It also tells the story of commercial lumber and fishing in the area. See the Sites Calendar page for summer 2017 days and hours of operation. Hours & Admission – The Historic School at Gay is open on a wide range of selected days during the summer. See the Sites Calendar page for summer 2017 days and hours of operation. There is no admission fee for this museum but a donation is appreciated. Related Links – You may wish to explore the following sites for additional information additional information about the school at Gay and the area.